VietNamNet Bridge – In 2010, Prime Ministry approved the national programme on developing non-fired construction materials by 2020. United Nations Development Programme in Vietnam and Global Environment Fund have supported efforts to reduce pollution by sponsoring the project of “Accelerating production and use of non-fired bricks". Việt Nam News’s Khoa Thu talks with UNDP Viet Nam Country Director Caitlin Wiesen on how Vietnam can promote green expenditure in the future. 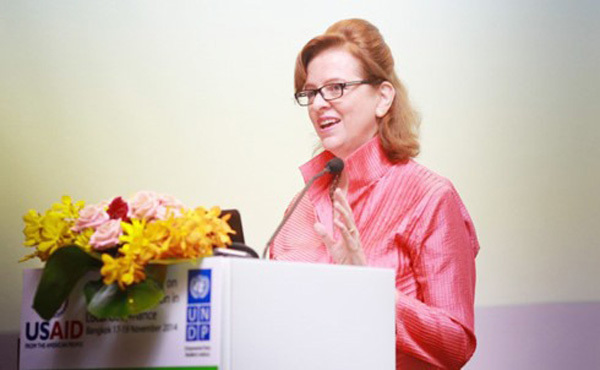 UNDP Viet Nam Country Director Caitlin Wiesen. Non-fired bricks are still new to Vietnam’s market. Why have the UNDP and GEF decided to invest in the project and what are major achievements so far? This is a very important project for the UNDP since non-fired bricks support companies to use waste from fossil fuel and reduce greenhouse gas emissions in a way that can be greener, more effective and healthier for the planet. UNDP has been working together with the Government, Ministry of Science and Technology and 23 companies looking at how to improve the standard for the non-fired bricks and also improve the production schedule for it. The main benefit has been shifting away from coal. So far at least two million tonnes of CO2 emissions have been reduced. We hope by the end of the project, the amount will be doubled. The second thing is to conserve the agriculture land as the traditional bricks use the top soil and a lot of agriculture land. And through the process, another advantage the production of non-fired bricks uses waste ash from thermal power plants so it actually reduces air pollution. Therefore, it has a multiple win for the environment, reducing pollution and improving the air quality. Also, we are able to introduce the first automated production here in Vietnam that helps to create high standards, increase the output and reduce the cost of non-fired bricks. Eight countries have come to Vietnam to seek out the technology to use in their own countries. These are important achievements of the project in the first phase. It requires working with the Government and the private sector. More than 1,600 people in 63 provinces have been trained. We are also working on policy and enable regulation that need to be put in place. Vietnam is one of the most vulnerable countries to climate change. To reduce impacts of extreme weather, efforts solely from Vietnam is not enough. How has UNDP supported the country in combating climate change? On the climate mitigation side, UNDP has been working very closely with the Government especially on looking at how best to raise the ambition on Nationally Determined Contributions (NDC) which is the key for the Paris agreement. Vietnam has committed to revise other ambitions, helping the number of ways to do climate expenditure review. Supporting to NDC revision is the major contribution that UNDP is offering. We are looking at the private sector expenditure as well. Energy efficiency in different types of areas of engagements such as construction is another field of interest. On the other hand, climate change adaption is what we are deeply engaged in the country. Vietnam is one of the most vulnerable countries in the world to climate change. We have been working to help Vietnam access the first green climate plan in ASEAN and that really supports to build the resilience of communities in the frontline of experiencing climate change. Building storm resilient housing is our focus. We have built several thousand houses and are set to reach 4,000. Mangrove restoration is another part of the effort. We have regenerated 4,000ha of mangrove so far. And the other is developing database. Database is for policy maker so that they can be better informed and better prepared for harsh weather events. More importantly, it is available for the people who are in the frontline, people in the community who are impacted by typhoon, storm, etc. so they have something handy on their mobile phones that they can easily access and understand. How do you evaluate Vietnam’s performance in accelerating green expenditure? Is there any room for both public and private sectors to improve? Vietnam has made a lot of progress in terms of bringing and attracting investment to it to the economy but there are certainly more can be done. One of the studies we produced last year shows that in the renewable energy sector there are advantages for private sector investors. At least US$10 billion could have been released very rapidly if the Government is willing to make some changes on its side in terms of feed-in-tariffs and exchange rates. It is a big opportunity to engage the private sector in the transition to green and clean the economy. We are hoping this year and the coming years we will see some of these changes taking place. With green financing, Vietnam could be a leader in transition to a carbon neutral future, achieve Sustainable Development Goals and the commitment it made in Paris. We do have some specific recommendations in engaging private sector engagement and attracting foreign investment. It could be a channel to help Vietnam to make that transition to renewable financially viable. There are also tremendous opportunities for the country itself to issue its own green bond so that they can finance themselves in the way that they can manage directly.